The widespread use of electronic Transaction Management systems among Arizona brokerages was initiated by AAR in 2008. This paper describes the rationale for using these systems as well as important factors to consider in choosing one. Click here to download this document. Looking for a Transaction Management system? Where’s the best place to start looking? 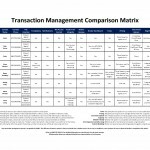 AAR has compiled information on some of the leading Transaction Management companies in the market today in the Transaction Management Comparison Matrix. The matrix was developed to give brokers a glimpse at the functionality available and how to contact them to get more information. If you have any questions, please call Business Services at 866-833-7357 or email support@aaronline.com.